Screenshot of Zello internet site belonging to "The State of the Islamic Caliphate," which has more than 10,000 subscribers. The authors of a new book on the Islamic State group say it has been making use of a high-technology application that’s been around for several years, but is relatively unknown in the United States - even though the company is based in Austin, Texas. “On the ground in ISIS-controlled areas, one of the things they use is an application called Zello,” Hassan Hassan told VOA's Mohamed Elshinnawi. Hassan and Michael D. Weiss are the authors of ISIS: Inside the Army of Terror. Part social media, part phone and part radio, Zello turns an iPhone or iPad, Android device, Blackberry, PC or Windows mobile device into a walkie-talkie at the push of an on-screen button. Zello uses a small bandwidth and minimal battery power, which makes it ideal for use in remote locations. It also can be paired with traditional two-way radios. The application allows users to hold single conversations in real time -- or broadcast voice messages to large groups. Its range stretches as far as a phone or computer’s data connection. In their book, Hassan and Weiss relate the story of a 14-year-old boy working in southern Turkey, who in October 2014 crossed into Syria to fight with Islamic State militants. His father later told reporters his son had been seduced to jihad after listening to sermons on Zello channels set up by Islamic State members. This iPhone screenshot shows a Zello channel purporting to belong to the "Islamic State of Iraq and Al Sham"
VOA found dozens of Zello channels belonging to supporters of the Islamic State group, including one calling itself “The State of the Islamic Caliphate,” which has more than 10,000 members and nearly 50 moderators. Zello has been used in other parts of the world, as well. Similar to other so-called "push-to-talk" cellphone applications like Voxer or iMessage, Zello operates across multiple platforms in 22 languages, including Arabic. 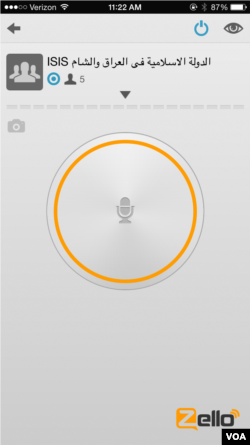 It allows users to share messages or save them for later playback. And it accomodates multiple channels. Like Twitter and other social media apps, Zello has helped activists and protesters across the world communicate under the radar of their respective governments. It powered Venezuela’s protests in 2014, and, as VOA’s Ukrainian Service reported last year, has been popular among pro-Russia separatists in Ukraine's east. Zello’s CEO Bill Moore said he wasn’t surprised to hear that the technology was popular among protesters.